For information on how to get involved with the department, contact Johan B. Ubbink at jubbink@calpoly.edu. If you’d like to make a donation to the FSN Department, please visit www.fsn.calpoly.edu/ or scan the code below! Amy Lammert was recognized for the many research proposals she submitted, the several awards she received, the number of active proposals she was working on and the many collaborators she worked with in 2017-18 academic year. FACULTY SPOTLIGHT Nutrition Professor Peggy Papathakis was awarded a Fullbright U.S. Scholar Program award to spend 10 months in Malawi, Africa, teaching and helping to build the curriculum for a nutrition training program for clinical dietitians at the University of Malawi College of Medicine. Papathakis joined Cal Poly’s Food Science and Nutrition Department in 2006, determined to engage in nutrition research in developing countries and provide global experiences for Cal Poly nutrition students. In the last decade, more than 30 students have worked on her numerous research studies focused on improving the nutritional intake of pregnant women in the small country of Malawi in southeastern Africa. Kari Pillola was recognized by the Grants Development office as the best faculty member in the Food Science and Nutrition Department to work with. Her colleagues acknowledged her infinite patience, noting that she is genuinely super-minded, patient and open to listening and understanding. Papathakis will now continue her efforts in Malawi by developing the curriculum and supervising students in a new nutrition program for Malawian students seeking careers in the field of nutrition and dietetics. This is Papathakis’ second Fullbright Scholarship; she received one as a doctoral student in 2001 to conduct research in South Africa on the dual impact of breastfeeding and HIV on women’s nutritional status. Papathakis is one of more than 800 U.S. citizens who will teach, conduct research, and/or provide expertise abroad for the 2018-19 academic year through the Fullbright U.S. Scholar Program. Recipients of Fullbright awards are selected on the basis of academic and professional achievement as well as record of service and demonstrated leadership in their respective fields. ALEKSANDRA KRISTO, Ph.D. Aleksandra Kristo studied nutritional sciences and completed her training as a registered dietitian at Harokopio University in Athens, Greece. She was a nutrition consultant for a weight-management center in Athens before continuing her graduate studies at the University of Maine. She earned her master and doctoral degrees in food and nutrition sciences while researching the role of polyphenol-rich wild-blueberry diets in hypertension and metabolic syndrome in animal models. Kristo was a founding faculty of the Nutrition and Dietetics Program of Istanbul Yeni Yuzyil University in Turkey, where she taught various nutrition courses and conducted research on the nutrition status and education of adolescents (minority high school students) and female college students in relation to adulthood chronic disease risk. She is interested in continuing this line of research at Cal Poly, aiming to improve chronic disease risk of college students through nutrition education. ANGELOS SIKALIDIS, Ph.D. Born and raised in Thessaloniki, Greece, Angelos Sikalidis earned a bachelor degree in mechanical engineering in 2001 from the University of Thessaloniki, Greece, a master’s in molecular and biochemical nutrition from UC Berkeley in 2006, and a doctorate in molecular nutrition from Cornell University. He has conducted research in the areas of obesity and cancer, amino acid metabolism, and signaling and use in chronic diseases such as Type 2 diabetes and risk attenuation. He served as a founding faculty member of a nutrition and dietetics Englishspeaking program in a private medical university in Istanbul, Turkey (Istanbul Yeni Yuzyil University,) where he served as an assistant/associate professor. At Cal Poly Sikalidis is interested in teaching the broader area of metabolism and involve students in Type 2 diabetes-related research. Aside from work, he enjoys spending time with his 2-½ year-old daughter and reading about the history of science and philosophy. HEATHER DONOVAN, M.S., R.D. After growing up in San Luis Obispo County, Heather Donovan wanted to attend Cal Poly. She majored in nutrition, with a minor in psychology. After graduating in 2013, Donovan started working in various kitchen positions at a skilled nursing facility, including as a dishwasher, prep cook and cook. In 2017, she moved to Louisiana to complete a combined master’s degree in nutritional sciences and a dietetic internship program. Donovan graduated in December 2018 and will soon be taking the registration examination for dietitians. At Cal Poly she is teaching FSN 121: Fundamentals of Food lab, FSN 250: Food and Nutrition: Customs and Culture lecture, and FSN 343: Institutional Foodservice I lab. She also has senior project students and assists in the grading for FSN 429: Clinical Nutrition I and 430: Clinical Nutrition II. Donovan is interested in research that involves nutrition for the elderly, institutional food service, community food programs, and psychology and food intake. She hopes to share with students her experiences while also continuing to obtain more experience in the nutrition field. Students making apple juice in the Food Processing Laboratory in the early 1960s. FOOD PROCESSING CELEBRATES 60 YEARS In 1959, Cal Poly launched its Food Processing Department, which would eventually become the Food Science and Nutrition Department. Sixty years ago, the emphasis was on preparing students for employment in the food processing industry. Field learning was combined with skills in canning, freezing and dehydrating food products, and classes included welding, food plant quality control, and food processing machinery. Today, we are still emphasizing the same Learn by Doing approach in training our students for successful careers in the food industry, but now with a much broader focus that includes food safety, product development, food chemistry and culinary science. The department will be announcing several events to commemorate the last 60 years of food industry programs at Cal Poly. We hope you will join us in these celebrations. THE VENESA W. STRONG MEMORIAL SCHOLARSHIP When former professor Venesa Strong passed away in 2016 after a lengthy battle with dementia, her husband of over 40 years, Lester, knew that by establishing a scholarship in her name, he would be celebrating her love of nutrition and dietetics. The Venesa W. Strong Memorial Scholarship was created through the Academy of Nutrition and Dietetics Foundation. The scholarship helps to relieve the heavy financial burden of becoming a registered dietitian by providing financial support to dietetic interns as they complete their supervised practice experience — a valuable resource to those already bearing large amounts of debt from their undergraduate studies. Strong earned her registered dietitian credentials in the summer of 1965 and worked her first job at The Methodist Hospital in Houston, Texas, as a nutritional professional in the Food Service Department. Strong constantly strived to learn more about her profession, which led to her earning a master’s degree in nutritional science from Cornell University. She spent time working at the Rochester New York Visiting Nurse Service, as well as teaching at Cal Poly. In 1996, Strong went one step further by earning an executive Master of Business Administration from UCLA. Strong was a member of the Academy of Nutrition and Dietetics Foundation for 50 years. She is remembered for her love of people, profession, education and family. She was an engaged lecturer for the Food Science and Nutrition Department at Cal Poly, where she taught for 21 years. She taught courses such as: FSN 321: Contemporary Issues in Food Choice and Preparation, FSN 315: Nutrition in Aging, FSN 250: Food and Nutrition: Customs and Culture, and FSN 210: Nutrition. Doris Derelian once asked Strong why she never sought a doctoral degree. Strong responded, “I have too much fun and too much to do to be stuck in one place, even Cal Poly.” Many faculty members remember fondly, and with great appreciation, the marvelous June graduation FSN Department celebrations that Strong planned and led for numerous years. They miss her directness, humor and her sharp sense of who she was. She is also remembered for her enthusiasm and colorful personality. Strong provided outstanding and unwaivering service to students and faculty during her career at Cal Poly, and she contributed where and when we needed her the most, even after her official retirement. 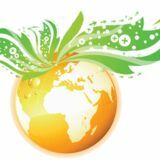 BEATRICE LUNDAY MEMORIAL ENDOWMENT The Beatrice Lunday Memorial Scholarship Endowment, honoring Beatrice Lunday (Nutrition, ’13) who died of brain cancer in 2017, was created by Lunday’s mom and Professor Peggy Papathakis. After years of fundraising, the $25,000 endowment is fully funded, and will be used to provide scholarships to students pursuing their master’s degree in nutrition. Donations can still be made in her name to increase the scholarship funds made available to students annually, including funding the very first scholarship award for the 2019-20 academic year. To donate, contact Kelly Owens-Davalos at 805-756-6235. 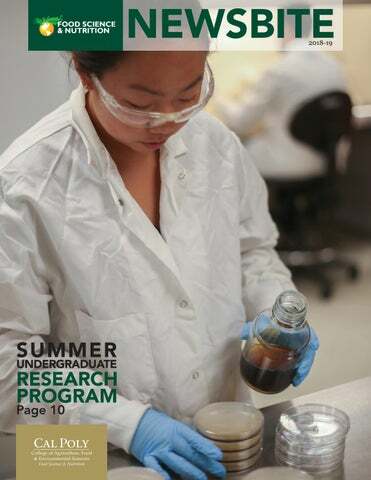 COVER STORY More than 85 students participated in the 2018 College of Agriculture, Food and Environmental Sciencesâ&#x20AC;&#x2122; 10-week Summer Undergraduate Research Program (SURP), conducting research with faculty mentors in departments across the college. The program, aimed at undergraduate students with outstanding academic potential, was launched in the summer of 2016 to give students the opportunity to have an immersive, hands-on research experience during the summer which might not be possible during the school year. Rebecca Bland, a senior food science student working with Associate Professor Amanda Lathrop, responds to questions. What were your expectations from the internship? I had heard great things about the Summer Undergraduate Research Program, and was excited for the opportunity to participate. I went into the summer hoping to clarify my area of interest within the broader area of food science. and to communicate these thoughts and questions more effectively. Senior student Kalina Gardiner also carries a concentration in nutrition science. She worked under the supervision of Assistant Professor Michael La Frano. What were your expectations from the internship? I expected to work closely with a nutrition professor on a project directly related to nutrition. I wanted to gain a deeper understanding of nutrition and nutrient metabolism, which is the area that my professor specializes in. I saw an opportunity to become trained using a new technique: a UPLC-mass spectrometer that is used for the identification of metabolites. I jumped at the opportunity to gain skills that could potentially open doors to future jobs. Describe your project. We developed and standardized methods in extracting metabolites from human and animal samples, including blood and tissue. The methods we standardized will be used in future research that Dr. La Frano and his team will be using on subsequent projects. What did you learn? I learned that research can be slow and definitely throws some curve balls! On that note, patience is needed. I learned a great deal about lab techniques and chemistry and how the UPLC-mass spectrometer works. Also, I learned how to analyze data and run statistical analysis to understand our findings. Our results show that we can lower the sugar content of cake by one-third, while not compromising sweetness and texture. Joy Lieuallen, a senior food science major, worked with Department Head and Professor Johan Ubbink. What did you learn? I learned a lot of things. I never realized that eggs supply the water content in a batter and small particles, like sugar, dissolve into it. We manipulated many parts of the recipe and were amazed how even the smallest differences can affect the taste of our products. What were your expectations from the internship? I expected to gain laboratory experience and knowledge on protein structure and interactions. Describe your project. My project was about the mechanical properties of zein, the principle protein in corn. The long-term goal of the project was to understand the mechanical properties of zein in order to use it as an ingredient in meat analogues. What did you learn? While I learned key laboratory skills and a lot about zein, the most valuable thing I learned from this experience was the structure of research. It is a slow process. It requires many trials and errors, and errors are good! Everything you do teaches you something and brings you closer to the answer. It is important to be patient and meticulous and to keep the bigger picture in mind. COVER STORY Senior nutrition student Baylee Wilhelmson worked under the supervision of Assistant Professor Michael La Frano. What were your expectations from the internship? I was expecting to gain experience in how to form and conduct a research study and how to perform lab procedures. Describe your project. The main focus of my research team’s project was vitamin A deficiency. In order to research this deficiency, metabolomics methods were used to assess the metabolic impacts of vitamin A deficiency in male Mongolian gerbil livers, which were collected from the University of Wisconsin. Metabolomics investigates hundreds of metabolites involved in metabolism, such as beginning, intermediate and final products of metabolic pathways. Our metabolomics analysis was performed on a liquid chromatography – Mass Spectrometry instrument and the data results suggested that the metabolites were different between vitamin A deficient and vitamin A sufficient livers. What did you learn? The SURP program provided me with such a great opportunity to grow as a student and as a researcher. Some important skills that I learned and practiced data entry techniques, statistical analysis procedures, tissue sample processing, and metabolite extraction methods. Each of these skills were challenging to learn, but they each taught me how important trial and error is in the research field to obtain results. I learned to come into the lab with an open mind each day because I never knew what challenges I would need to overcome. Katy Yamada and Associate Professor Amanda Lathrop worked on their SURP project. Yamada entered the blended master’s program in fall 2017. What were your expectations from the internship? I didn’t have many expectations. I had gotten involved in research during the 2017-18 academic year and wanted to continue. It was a little stressful to take charge of a single project, but it was nice to know I could go to the faculty advisor in charge and get help. Describe your project. I was looking at the growth/die off/survival of E. coli O157:H7, a food-borne pathogen in a model hard cider system. I created an environment that mimicked that of hard cider just based on pH and alcohol by volume percent. The goal was to determine the fate of E. coli O157:H7 in the model system. This was preliminary research aiding toward the bigger goal of ensuring that hard cider in the market place is safe for consumers. What did you learn? I think SURP is a great opportunity for students who are interested in expanding their knowledge on certain topics, getting hands-on experience doing research. It allows you to gain independence when it comes to research ideas, and being introduced into the research world. It taught me a lot about my own capabilities and expanded my knowledge in food safety. LIFE AFTER POLY beer. You can really feel that as you walk around our campus, and you can taste it in our beers. I started as an intern as part of a team of six doing tasks such as media prep, plating of micro samples, sampling tanks, running the UV spec, running our daily sensory panel and covering the occasional packaging night shift when they were short. As the leader of a team of 11 people, I am now responsible for the “big picture” tasks of the Quality Lab, including: overseeing all lab testing and analyzing data produced, reporting data to the correct parties, monitoring fermentations, troubleshooting production issues, maintaining yeast cultures, assisting with development of new beers, working with the warehouse on product holds, communicating with the other breweries in our family (Firestone is partially owned by Belgian brewery, Duvel Moortgat) on troubles we are having, maintaining all standard operating procedures to current industry standards, helping commission new equipment, and so much more. In the coming years, I will continue to work on expanding our Quality Lab as well as our research and development program. I have is don’t be afraid to ask questions! In an industry as specified and technical as brewing, there is so much information. Again, the people who I have seen continually grow are the ones that question everything and have the thirst to learn more. Golnaz Ghomeshi Friedman (left) with Academy of Nutrition and Dietetics President Mary Russell in Washington, D.C..
Poster presentation on evaluation of geriatric patients at the NATCO Transplant Conference in Louisville, Kentucky with registered dietitian colleague Rachel Perez. Golnaz (right) receiving California Academy of Nutrition and Dietetics president gavel from Past President Ruth Frechman. evaluated for candidacy by a multidisciplinary team, including a transplant nephrologist, registered dietitian and licensed clinical social worker. In addition to caring for ESRD patients, I evaluate anyone who is interested in donating a kidney. Similar to the evaluation process for transplant candidates, all potential living donors are evaluated by a multidisciplinary team to ensure they are fit for surgery. I primarily counsel potential living donors on the importance of an overall healthy lifestyle to prevent chronic disease such as diabetes and hypertension that can increase risk of kidney disease later in life. I absolutely love the population that I work with. It’s very specialized, but it’s very rewarding. It’s amazing to see patient’s lives transform after a transplant. The generosity and selflessness of our living donors is something that cannot be explained. It’s a very rewarding field to work in. What advice do you have for students who want to pursue a career in nutrition? Do it! I truly believe in the power of nutrition. It’s relevant in so many areas of practice — everyone has to eat. My most obvious piece of advice is to pursue a dietetic internship. The best career you can have in nutrition is one as a registered dietitian. If you don’t match the first year, don’t give up. Get some work experience and apply again. Once you become a registered dietitian, know that you can have a hundred different jobs and still be an R.D. There are so many different areas of practice, including public health, academia, school nutrition, clinical nutrition and private practice — and within each of those practice areas, there are so many different types of jobs. Another piece of advice is to get involved with the Academy of Nutrition and Dietetics, whether it’s at the district level, the state level or the national level. It is truly the best way to network, open the door to new opportunities, and move our profession forward. My last piece of advice is to stay in contact with your Cal Poly family — your professors and classmates. I can’t even explain how valuable these relationships have been to my career. Any final comments or advice? The best piece of advice that I have received from a mentor is, “Say yes to the things that scare you most.” This piece of advice has led me to take on opportunities and challenges that I never thought I was old enough for, experienced enough for, or skilled enough for. It led me to apply for a position at UC Davis that I never thought I could get, and now I have a career that I love. It sounds cheesy, but believe in yourself. If you don’t, surround yourself with a network that believes in you. The Cal Poly Food Science Club is an inviting and inclusive environment for food scientists and food enthusiasts alike to congregate and network toward fulfilling careers and full stomachs. The club’s main objectives are to connect with industry professionals to build strong networks, create a Cal Poly food science community, engage the public in food science, and ultimately prepare students for their future careers. This academic year, we are excited to host guest speakers from industry such as: Impossible Foods, Clif Bar & Company, Ecolab, Lyon’s Magnus, Wild Groves Olive Oil, Whalebird Kombucha,and the Specialty Foods Association. These guest speakers are extremely valuable in providing perspectives on how to achieve a successful career in the food industry, as well as internship and job opportunities. Students also build their network by attending conferences such as the Southern California Institute of Food Technologists Supplier’s Night, California League of Food Processors Expo, and our newest event: The Fancy Food Show in San Francisco. The Cal Poly Food Science Club connects students with the Institute of Food Technologists Student Association. In 2018, the Cal Poly College Bowl Team won the Pacific Southwest Area Meeting and competed in the finals at the Institute of Food Technologists National Meeting in Chicago. We are excited to cheer on College Bowl and our product development teams this upcoming year! For more information, contact: calpolyfoodscienceclub@gmail.com. The Cal Poly Nutrition Club is comprised of nutrition students and other majors hoping to become future nutrition health professionals. We strive to cultivate friendly and professional relationships among faculty and students interested in nutrition. We invite professors in the Food Science and Nutrition Department to discuss their research and educational backgrounds, for the members who wish to follow in their footsteps or to simply get to know the instructors. The professors provide club members with valuable opportunities to work with them on their research projects at Cal Poly. As a club, we want our members to feel confident about their future career paths, so we invite those who work in the nutrition field within the San Luis Obispo community to talk to us about their careers and responsibilities. Registered dietitian Kaitlin Gibbons from Campus Dining Wellness and Sierra Vista’s Clinical Nutrition Manager Shannon Burman, both Cal Poly alumnae, recently talked to students about their careers. Although we are an academic club, we create events outside our club meeting hours that are focused on building our careers and experiences. We accomplish this is by providing members with connections to nutrition-related volunteer opportunities on campus and in the community. Our members have volunteered at the Food Bank Coalition of San Luis Obispo County, City to the Sea half-marathon, SLO Triathlon, Boys and Girls Club of South San Luis Obispo County, and the YMCA. We try our best to give our members all the volunteer opportunities they need to best serve the local community and their interests! Through the mission and goals of the Nutrition Club, our organization offers a variety of ways for members to engage in networking events, research and volunteer opportunities to further enhance their experience in the field of nutrition and dietetics. For more information, contact: calpolynutritionclub@gmail.com. If youâ&#x20AC;&#x2122;d like to make a donation, please visit www.fsn.calpoly.edu/ or scan the code.